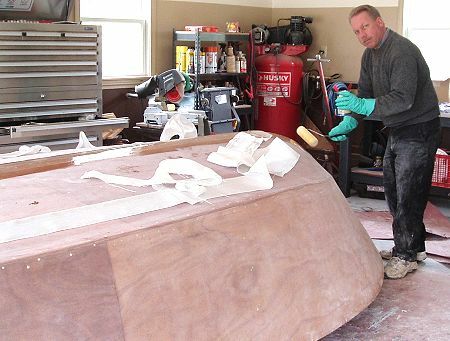 Hull is ready for covering, fiberglass & epoxy. 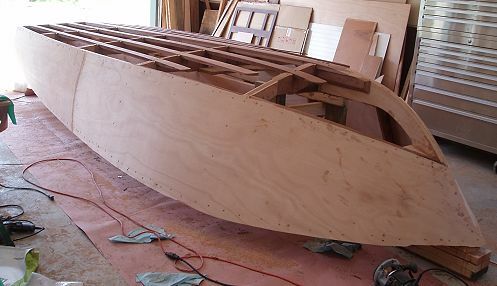 Enclosed picture, little old, bottom is planked, screw holes filled, all faired now. Built with 5/4 mahogany and okoume plywood. Great deal on the 5/4 mahogany at '84 Lumber'. Thanks 'Glen-L'! Couldn't have done it without you. This is a "crawl before you walk, walk before you run" project for me, I'm looking ahead at building the "Hercules" next. 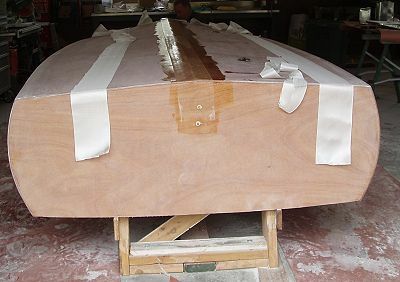 All "planked" almost finished fiberglassing, 1 side to go! No time, no Poxy Shield, where does it all go? the time and Poxy Shield I mean! I'm going to paint the hull but finish the top 'bright'.